The Grand Final is the climax of the national domestic league, when the top two teams from the season battle it out in a winner-takes-all clash on Saturday 10th September. 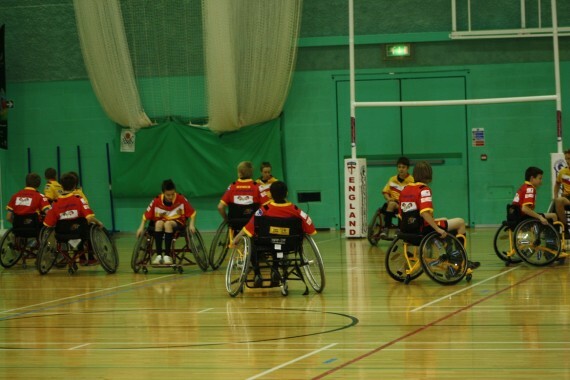 This event follows the success of previous international wheelchair rugby league competitions staged at Medway Park, including the European Championships in 2015 and the World Cup in 2013. Recently crowned Challenge Cup winners and reigning Premier League champions Halifax WRL have already secured their spot in the Grand Final. They will be joined by either Leeds Rhinos or North Wales Crusaders. The match, which will be held at Medway Park from 7pm, will feature a host of world class players who have competed in previous international matches at Medway Park, including England captain Jack Brown and vice-captain Wayne Boardman. In the build up to the main event, four local teams will also contest in the inaugural Kent Cup: Medway Dragons, Gravesend Dynamite, Dartford Vipers and new Dartford-based team The Argonauts. They will compete in a round-robin competition from 1.45pm, with the top two teams fighting it out in the final at 5.15pm. Tickets cost £5 for adults, £2 for children or £12 for a family of two adults and up to four children and are available online at www.medway.gov.uk/leisurebookings or by phone on 01634 336652. The tickets are valid for the Kent Cup matches and the Grand Final match. This entry was posted	on Thursday, August 11th, 2016 at 9:00 am	and is filed under Featured, Other Sports. You can follow any responses to this entry through the RSS 2.0 feed. Both comments and pings are currently closed.